RIT Big Shot No. 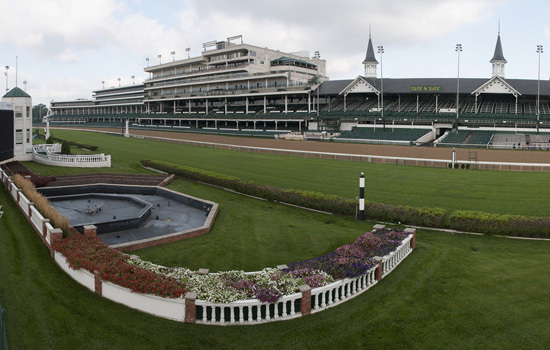 31 is scheduled for around 9 p.m. on Oct. 3, when the photography team will point its lenses at iconic Churchill Downs, home of the Kentucky Derby. The next RIT Big Shot promises to be a beautiful photo finish when Rochester Institute of Technology’s longtime community photography project captures a spectacular nighttime image of a national icon—Churchill Downs, home of the Kentucky Derby, in Louisville, Ky., on Oct. 3, 2015. The Big Shot relies on the participation of hundreds of volunteers to provide the primary light source for the image while RIT photographers shoot an extended exposure. It’s a signature event for RIT and is led by the School of Photographic Arts and Sciences, which is nationally recognized for its degree programs. Often described as “painting with light,” the Big Shot asks volunteers to “paint” or shine their light source onto a particular area of the landmark while the photograph is taken. The light sources are usually either handheld flashlights or camera flash units. RIT organizers are hoping to engage hundreds, if not thousands, of volunteers to come out to participate and illuminate Churchill Downs, one of the most famous thoroughbred racetracks in the world. Last year’s 140th Kentucky Derby—the oldest continuously held sports event in the United States—drew more than 16 million television viewers and on-track attendance of nearly 165,000. “We invite all of Kentucky and Southern Indiana to come out with their flashlights on Saturday, Oct. 3, and be part of something they will never forget,” Peres added. Residents will join RIT students, faculty, staff and alumni for the photo, which will be taken after sunset on Oct. 3—around 9 p.m.—regardless of weather conditions. Doors will open at 7:30 p.m. Volunteers are asked to arrive no later than 8 p.m., bring either a flashlight or a camera flash unit, and wear dark clothing. Volunteers will be broken into lighting teams and placed around the racetrack’s interior and in the grandstands by RIT organizers before test photos are taken and the final photo is captured. Since RIT started its Big Shot project in 1987, the event has traveled to several national landmarks and twice crossed the Atlantic Ocean. Through their viewfinders, Big Shot photographers have captured such landmarks as AT&T Stadium (formerly Cowboys Stadium) in Arlington, Texas; The Alamo in San Antonio, Texas; the U.S.S. Intrepid in New York City; Pile Gate in Dubrovnik, Croatia; the Royal Palace in Stockholm, Sweden; and the Smithsonian National Museum of the American Indian in Washington, D.C.
Nikon Inc., a longtime sponsor of the Big Shot, will be the event’s premier sponsor. Nikon is loaning high-end photographic equipment to capture the Big Shot photograph, which will be produced using three Nikon D810 bodies. To learn more about the project and view photographs of past Big Shot images, go to https://www.facebook.com/RITBigShot or http://bigshot.cias.rit.edu/. The project also can be followed on Twitter at @RITBigShot.